A women's transition to infertility is a natural process that can trigger many symptoms that impose strain on your daily life. In order to be dealt with effectively the signs and symptoms of menopause must first be understood. Keeping a considered diet is an excellent way of managing these often bothersome experiences. 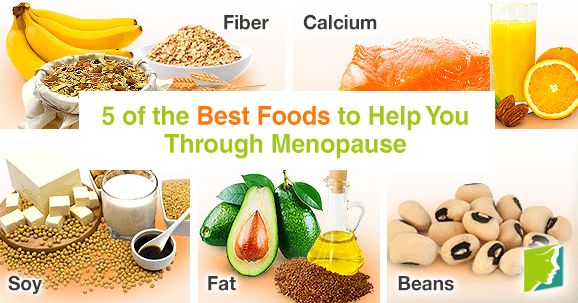 Keep reading to discover the top 5 foods that will help you cope with menopause. A key staple in any diet, consuming more fiber during menopause is an especially beneficial move. The nutrient has the ability to prevent constipation, lower cholesterol and blood glucose, in addition to improving other health concerns that can accompany menopause. Use fiber-rich products instead of refined carbohydrates like pasta and white bread as this will make your systems run smoother and your body feel better. As we age our bones become weaker. Menopausal women especially are prone to suffering from osteoporosis due to reductions in estrogen. Fortunately calcium is famed for its ability to help build strong bones. To reduce your chances of suffering from potential debilitating diseases such as osteoporosis include more milk, almonds, orange juice, and salmon in your diet. Women wishing to relieve the effects of menopause symptoms need to take steps to rebalance their hormones. Soy products offer a natural remedy as they contain phytoestrogens; plant compounds that mimic the effects of estrogen. Good fats are needed in your daily diet. Whether you are 10 or 50, they are always vital for your body. Women going through menopause also find that fats help them balance hormones whilst also moderating appetite and vitamin absorption. Beans are brilliant. They are nutritious, tasty and they help your body function. In addition to helping regulate your system, beans are also high in folic acid, vitamin B6 and calcium. Add beans to chili's and salads to ensure that your diet incorporates this essential food. Whilst women can have separate or specific dietary needs, the five items detailed are central recommendations for maintaining hormonal balance during menopause. Try to also consume five servings of fruits and vegetables on a daily basis. Exercise and stress relief are also important so your alcohol intake should be limited. Click on the following link for more information about menopause. Menopausal symptoms can negatively impact a woman's overall health and well-being. Keep reading to learn about the types of treatments available.